Air Ionizer Purifier Negative ions bring high efficiency air filtration, it also is good for emotion lifting, no ozone. So, aside from listing our top air purifiers for 2019, we have added a concise list of all the health benefits associated with the use of air purifiers in houses, especially ones with children, pet and elders, as well as a buying guide for further reference. The Philips AC3256/30 3000 series Air Purifier is a large sized unit which cleans the air, as well as helping people control their allergies by removing the triggers that can cause them, making it one of the best on the market at the present time. The AC3256 Air Purifier has a very high Clean Air Delivery Rate (CADR). In fact, higher than any other on the market at 367m3/h. This means that it is capable of removing ultra-fine particles, even as tiny as 0.02 microns and can seize 99.97% of common airborne allergens. When switched on, the air quality light indicator opens in the air well which enables users to rapidly gauge the air quality surrounding them. The colour ring is highly efficient and immediately informs users of the present state of the air in their home. For example, the bright red light means very dirty air, purple shows moderate quality of air, and the cool blue is for clean air. Since most of us live in a fairly clean environment, the cool blue light usually shows. The indicator would only get to purple and red in very heavy environments. As well as the colour indicator, there is a professional sensor located on the side panel near the middle of the unit. This shows the indoor air quality employing a respiratory PM2.5 indicator. Should the indicator detect a high reading, you should begin to worry. In a normal environment, it registers about 10 and then falls to 1 or 2 after about an hour or two. You should note that the sensor is very sensitive and will detect dust stirred up as you walk past the unit. PM2.5 stands for Particular Matter, and the 2.5 indicates the particles in the air which measure 2.5mm (micrometres or microns). This is a measure employed for atmospheric pollutants such as organic dust, airborne bacteria or other man-made particles such as construction dust or coal particles from a power plant but not gas pollutants. The high CADR of the Philips 3256 air purifier means it can capture 99% of bacteria in just an hour and remove 99% of dust, pet hair, pollen and in some cases even viruses such as H1N1. It also protects against harmful gases. 5 Speed Modes are available plus 2 auto modes (auto and allergen auto). The unit is so quiet (33dB) in auto fan mode that it can be used right beside your bed if desired. The night mode reduces the fan speed and noise level for sleeping, and you can also switch off the panel lights and colour ring to ensure a peaceful night’s sleep. The unit is light and easily moved around by the handle. The filters are included, but you need to unpack and replace them before use. Stage 1 – Pre-filter to filter out hair, dust and large particles, this is a carbon filter. Stage 2 – Activated carbon filter to remove odours and gases. Stage 3 – A thick NanoProtect HEPA and AC filter for extra efficient extraction and purification. The filters are all easy to clean and replace. Just pop open the front panel which is kept in place with catches and magnets. It is simple to latch and click back into place when the filters are installed. These filters offer excellent protection to people who suffer from allergies, especially pollen which causes hay fever. The special AL (allergen mode) is specifically to extract common airborne allergens. By employing the air quality sensor and indoor pollution level plus airflow and operation time, the filter’s lifespan is calculated to alert the user when to change the filter(s). The sensor touch interface has a large numerical display and intuitive options to facilitate use. The Philips AC3256/30 3000 series air purifier is an excellent buy, and we recommend it highly. It is efficient, doesn’t take up much space and although noticeable, it is of modern design and should fit into any home with ease. It is especially recommended for anyone with allergies but even if you don’t suffer from them, this air purifier will improve your health, and you can be sure that the air you breathe at home is pure and clean. 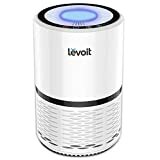 The Levoit LV-H132 is a smaller sized air purifier which is ideal for a bedroom, workroom, office, studio or could even be used in a hospital room. It is small enough to place on a nightstand. The Levoit LV-H132 purifies the air in 86 square feet perfectly and is easy to move and place anywhere. It stands 14.5 inches high and is cylindrical in shape with a diameter of 8.5 inches and weighs 6.6 pounds. It requires about 14 inches free space from walls, radiators or anything that could interfere with its airflow. 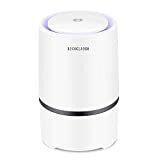 This small air purifier is very easy to set-up, just remove the plastic protective wrapping then give a half-turn of the base to remove the bottom plate, giving access to the filter. Remove plastic wrapping and replace the filter, reattach the base and plug it in. There is a manual and instructions for setup which are easy to understand and clear. The LV-H132 will eliminate 99.97% of all contaminants down to 0.3 microns, including allergens, smoke, dust, mould, pet hairs and odours. To access each setting, you just need a light touch of the fingertip. If you only have a small area in which you need an air purifier, this one is excellent. It will even remove the strong smell of paint in a studio. It is efficient, quiet, easy to setup and use. The Pro Breeze 5-in-1 air purifier is especially ideal for anyone who suffers from allergies. Instead of just taking a pill to get rid of allergy symptoms, it is far better to remove the causes, and you can do so with this unit with ease. Fully Complied with CE and RoHS. The Pro Breeze is compact with a simple design and will fit in comfortably anywhere. It is white with a silver circle on it and contains a touch panel. This had a blue backlight, and you can adjust the airspeed and set the timer and sleep mode. This unit is suitable for any space up to 500 square feet. It has automatic timers built in so that it can switch on or off after 1,2 or 4 hours. The nighttime mode ensures you can enjoy a peaceful sleep. The Pro Breeze has five stages of filters and will filter out allergens, dust, mould, hairs and odours by capturing 99.97%. It can seize particles as tiny as 0.3 microns. On top of this, the unit has a Clean Air Delivery Rate (CADR) of 218+. The unit has a negative ion generator which neutralises and cleans any pollutants from the air with the negative ions. These negative ions attach themselves to unwanted positive ions in the air, thereby purifying the air and thereby enhancing your mood. Negative ion units are very efficient at getting rid of airborne bacterial infections. They also reduce static electricity build-up in electronic equipment. The large surface areas of the filters ensure that the air is purified to the highest degree possible. The Pro Breeze 5-in-1 air purifier consists primarily of a Pre-Filter, this is the first stage which air passes through and will trap large airborne particles like pet hair and dust. The next stage is when the air passes through a True HEPA (High-Efficiency Particulate Air) Filter, which captures smaller particles like dust mites, pollen and pet dander, which is skin shed from pets that can cause allergies. By this stage, 99.97% of 0.3-micron particles have been captured by the filter. Following is an Activated Carbon Filter which will absorb odours from the home, contaminants and pollutants. The Pro Breeze also deals with Volatile Organic Compounds (VOCs) which can prove harmful, (such as formaldehyde). This is especially useful in an office where there are photocopying machines. This air purifier can actually eliminate many carcinogens. The last filter is a Cold Catalyst Filter where any remaining impurities are captured. The filters can be replaced when necessary. 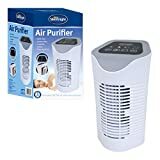 This is probably the best air purifier for anyone whether you have allergies or not as the five different filters ensure that nothing damaging escapes and so the air is clean, fresh and pure. It will fit in anywhere in your home or office and is not noisy. It is an excellent buy in our opinion. Rigoglioso is not a well-known brand name, and although it sounds Italian, it is actually a Chinese company selling on Amazon. It is very similar to the Levoit, but it is 40% cheaper. The design of the Rigoglioso is also very much like the Levoit although smaller. It is 8 inches high and 5 inches in diameter. This unit has a True HEPA (High-Efficiency Particulate Air) filter as well as an activated carbon filter. Replacements are available separately. The design is simple with no fan speed settings and the button on the top has a knack to it. Pressing it once turns the unit on and pressing it twice places it into sleep mode. The built-in nightlight is dimmed on sleep mode, and the unit turns itself off automatically after 8 hours. The dimmed light stays on. The power is supplied by a USB data cable which is included, but you need to plug it into something like a phone charger plug. The unit makes very little noise, probably because the power is so low. The Rigoglioso removes odours efficiently and is ideal for small rooms. The Rigoglioso air purifier does an efficient job of removing odours and is ideal if you are on a budget and just need it for a small room. It is definitely the best cheap air purifier on the market. All houses contain harmful particles, posing a threat to human health even of the residents do not suffer from allergies. From shielding your respiratory system to enhancing your mood, air purifiers are indeed necessary for those among you that seek a healthy everyday environment. They minimise asthma incidents, making them absolutely necessary for people suffering from asthma. They eliminate allergens, the substances that cause and trigger allergic reactions and shocks, including dust and pet odour. Air purifiers that do not release ozone are even better. They purge the air from tobacco and cigarette smoke, thus reducing the risk from developing some kind of lung disease and minimising secondary smoking. This is very important for children and elderlies, whose respiratory systems are very sensitive. Air purifiers extract airborne asbestos particles, reducing the risk of developing mesothelioma., True, asbestos is now used any more in building materials, but old houses may have components with this poisonous They also eliminate radon gas, that causes lung cancer. They also remove urban fumes and pollutants coming from outside, as well as carbon dioxide and the highly carcinogenic Volatile Organic Compounds (VOC). Air purifiers also get rid of mosquitoes and other similar insects, often associated with dangerous infections. Clean air improves mood levels, and air purifiers with ionisers are even more effective from this point of view. In addition, inhaling air free from pollutants alleviates stress. VOCs (Volatile Organic Compounds), found in products such as paint, varnishes and cleaning supplies. Why Should I Consider Buying an Air Purifier? removing or at least minimising smoke and all related odour. What Types of Air Purifiers Are Available in the Market Today? While there are numerous models and brands available in today’s market, they all fall into four basic categories, based on the filtration technology they use to clean the air around you. HEPA is currently one of the most advanced an air filtering process, using a highly dense paper filter designed to trap airborne contaminants and a strong driving mechanism. While numerous air filters use the HEPA sign, only the ones labelled with the phrase “True HEPA Filter” are worth your consideration, since they are the only ones certified as capable of removing 99.97% of all particles of at least 0.3 microns. The rest, using signed as “HEPA-type” or “HEPA-like” can only filter particles of 2-5 microns in size, which translates in a stunning 600% efficiency decrease. Air purifiers with HEPA filtration technology are highly efficient and are considered the best possible option for people with respiratory sensitivity and severe allergies. On the other hand, they require regular filter replacements, which, sometimes are a bit pricey. Keep also in mind that they cannot rid the air from all unpleasant smells and chemical fumes. Ionic filtration emits a cloud of charged ions into the air, which in turn attach to airborne contaminants, thus adding weight to them and causing them to drop down to the floor or other intervening objects. Some models also make use of an electrostatic collection plate in order to attract fallen particles and remove them from the room. The efficiency of ionic filtration is overwhelming; it can filter out particles as tiny as 0.01 microns! As an added advantage, they basically require zero maintenance and need no filter replacements. In addition, since they use no fan, they are much quieter. On the other hand, the particles and pollutants remain inside the room (except in air purifiers equipped with an electrostatic plate), which means you will have to clean it thoroughly and frequently. Bear also in mind that they cannot remove odours, and they produce some ozone while operating, which is not the best thing for people suffering from asthma and other respiratory maladies. Carbon filtration uses a specific type of activated carbon consisting of numerous microscopic absorbent pores, designed to trap fumes, gases and odours – not particles though. Hence, carbon filtration is ideal for refreshing the air smell, not for purifying it. That explains their low price. Last, we have air purifiers using ultraviolet light (the UV-C band in particular), which destroys pollutants instead of filtering them out. Note that the UV light is not emitted inside the room but within the air purifier. The band used is totally safe for humans but not for bacteria and viruses, since it destroys their molecular DNA structure, thus sterilising the air around you. While capable of eliminating bacteria, viruses and germs, UV light air purifiers can only do that. They cannot remove particles. That is why UV light technology is often integrated within the air purifier with one of the other three filtering technologies. Is There Any Other Type of Classification? Yes, all air purifiers regardless of the filtration technology they use can also be classified in two “versions”, the Classic and the Smart Enabled ones. Classic air purifiers basically do the job without letting you know anything about the cleaning process. You just hear their humming and see the dirty filters and realise they are actually working. Certain models are equipped with air quality sensors, but again do not share any of these data with the user. As you have probably guessed, smart enabled air purifiers are designed to share all sorts of data through a dedicated application in your mobile device or tablet. These data may include the specific pollutants that are being removed (for example pollen, hair or dust), and notify you of the current air quality. Naturally, smart enabled air purifiers are a bit more expensive than the classic ones. What are ACH and CADR Ratings? These are two ratings commonly used in air purifiers specifications and is best to know what they mean before making your pick. Usually overlooked, the ACH rating actually tells you a lot about the air purifier’s efficiency. It reveals the number of times it can clean and refresh the air in your room every hour; a 5x rating, for instance, means that this specific device can clean the air in your room five times within 60 minutes. Of course, the rating largely depends on the maximum surface (measured in square footage or square metres) the air purifier is designed to handle. If, for example, it is designed to manage a surface of 100 square metres, and your room is smaller, then its ACH rating gets even bigger. If, on the other hand, your room is bigger, than the actual number of air changes per hour will be smaller. This rating reveals how well (not how many times) an air purifier cleans the air within a room of certain dimensions; it basically tells you about its effectiveness, and it is very useful when comparing air purifiers. The CADR rating is measured using certain common pollutants, namely dust, tobacco smoke and pollen. Measurements usually range between 10-450 and are displayed in three consecutive numbers, for instance, 200/220/190. Naturally, the higher each number, the more effective the device is for this particular particle. Unfortunately, not all air purifiers have a CADR rating on their specifications. Still, you should look for it anyway. One of the most important specifications of an air purifier is its covered area. Make sure you check the square footage (or metre) rating of the air purifier that caught your eye and make sure whether it will meet your needs. Digital controls can be found both in classical and smart enabled air purifiers, allowing for more precise settings. This feature is by now standard to all new models, which have 2-5 different fan speeds. More advanced models designed to clean the air faster than usual, also have a turbo speed mode. These also tend to become a standard feature. Filter replacement indicators basically notify you that the time has come to replace all or certain filters of the device. This is very handy since it ensures the proper operation of your air purifier. Otherwise, you would consume energy but still inhale unclean air. This feature allows you to deactivate the air purifier at a specific time or at a pre-set time interval – usually ranging from 2 to 8 hours. Saving energy and time, programmable timers are ideal for people that need their purifier to run even when they are out of home. Obviously, for easier transportation. Some air purifiers with multiple filters and mechanisms can get quite heavy. Casters, on the other hand, add portability, enabling you to move the device around the room without lifting it. This handy feature allows you to locate the air purifier more easily in a dark room. A standard feature for all smart enabled air purifiers, it affords you full control of all features of your air purifier through your smartphone or tablet, along with important data about the air quality and pollutants. Air purifiers with this feature have an extra filter designed to capture large particles, like hair or dirt and prolong the operational life of the rest of the filters, which are usually more expensive. The best thing about pre-filters is that they can be washed and reused, thus reducing maintenance cost even more. Antimicrobial treatment is actually a coating designed to prevent the accumulation of bacteria and microorganisms on internal filters. This feature not only improves the air quality but also prolongs the operational life of each filter. Designed to monitor the air for certain particles and pollutants, the air quality sensors constantly optimise the settings for more efficiency. Plasma Wave Technology is an advanced ionisation method that uses water vapour instead of negative ions, making it even safer and ozone-free. This advanced filtering method is usually combined with UV Light technology. It oxidises chemicals and eliminates VOCs, bacteria, mould and fungi more effectively. Most air purifiers require some kind of maintenance to preserve their efficiency. Before getting impressed by an array of features, you should also check the corresponding maintenance cost, especially regarding filter replacement. As mentioned, ionic air purifiers are the most economical when it comes to maintenance, but this usually makes them more expensive to purchase. Air purifiers produce some level of noise, and if you are light sleepers or a member of the family has trouble sleeping and wakes up easily, you should make sure the noise will not be a problem. Naturally, air purifiers with adjustable fan speeds produce louder noise while operating in their top speed or turbo mode. However, you can probably use this speed during the day, so, better check the noise produced at the lower speed. Most air purifiers consume around 5-200 watts, and models with Energy Star rating are preferable. Last, you should also check the warranty, that is the timespan and issues it covers, thus avoiding issues with problematic components – which are always possible even with the most reputable manufacturers. Remember, an air purifier is a device that you should be able to use for many years to come. It is nothing less than a small investment, aiming at protecting your health and the well-being of the people you love. It would be wise to devote some time to find the one that meets your needs and wishes.